Skarvefossen is a beautiful but underappreciated waterfall, 8 kilometer Northeast of Granvin with a total heigh of 150 meter and a single drop of 120 meter. We were surprised by the amount of water thundering down from the mountain. The river Skorvo is fed by several small glaciers going up to an altitude of 1.576 meters. Most people drive by this extremely powerful waterfall in the river Skorvo. Maybe because Skarvefossen (also named Skorvefossen) is difficult to find if you don’t know where to go. 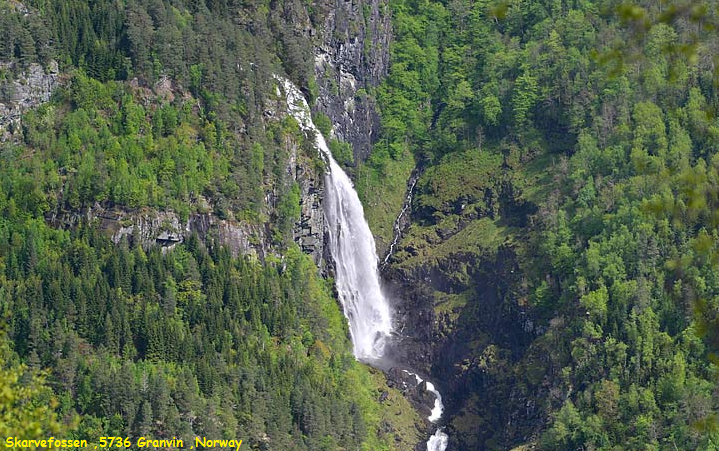 Driving on road 13 from Granvin to Voss take the exit to Seim, just after the Granvinsvatnet. Drive up 500 meters until you cross the river Skorvo. From here you can walk a little bit nearer to the falls, but not as fare as you would wish.